Status: Active. However, the illustrated example is out-of-print. Information: Illustrated above is the April 1978 issue. This magazine occasionally ran manga versions of "Gatchaman." The above issue featured a 21 page, adaptation of episode 1 "Gatchaman Vs. Turtle King". It featured a two page color introduction and title page, the rest was monochrome. Additionally, it included a full color, fold-out poster. 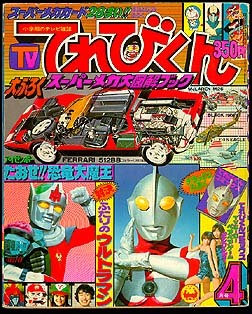 Later issues featured original "Gatchaman" manga stories, with at least one known, two-part original "Gatchaman I"I story.